BioZyme® Inc, announces the hiring of Sam Silvers, Junction, Texas, as one of its newest team members. 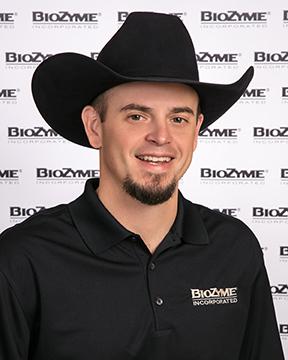 He will serve as an Area Sales Manager in West Texas, to develop new and build upon current dealer and customer relations while promoting BioZyme’s many brands. “As a user of the BioZyme products myself, I have always appreciated the quality control and science behind these products. I am looking forward to the opportunity of sharing these products and having more of a platform to promote them to a wider audience now as I represent the company,” Silvers said. Silvers has an extensive background in the livestock industry, having raised sheep since he was 9-years-old. He and his family continue to successfully raise show lambs as well as commercial sheep and goats. He earned his master’s in ag science from Texas A&M, Kingsville. He received his bachelor’s from Texas Tech and also attended South Plains Community College, where he participated on the livestock judging team. Silvers has worked as a county extension agent, sold farm and ranch real estate and also sold livestock mortality insurance. Silvers and his wife, Jurahee, have two children. In addition to spending time involved in the livestock industry and with his family, he enjoys hunting in his free time. BioZyme is known for its supplement brands VitaFerm®, Sure Champ®, Vita Charge®, DuraFerm® and Vitalize®. The company also manufactures and markets Amaferm®, the key additive in all its supplements. For a list of BioZyme Area Sales Managers, visit http://biozymeinc.com/our-staff. Cesar Ocasio Joins International Team at BioZyme® Inc.BioZyme® Hires Jack Oattes as Sales Manager in Canada, Northeast U.S.